Just because summer is winding down, does not mean that the barbeque will be put to sleep just yet. If you’re a die-hard griller, you know that there are still plenty of late summer nights left to enjoy the smoky taste only a barbeque can deliver. For years I have been the brunt of too many jokes at family barbeques, as I munch on salad while my family eats cheeseburgers and hot dogs (I am still not interested, Uncle Peter, but thanks for offering every single time for the last decade). This summer I thought that it was finally time I got my act together to create a real, grill-able, vegetarian version of the classic burger good enough for carnivore to eat. Now, I have absolutely tried my best to make these before, but there are always problems, such as the patties falling apart while cooking, too dry, too moist, too “vegetarian-tasting”. It is not until now that I have the confidence to say I’ve finally mastered it. 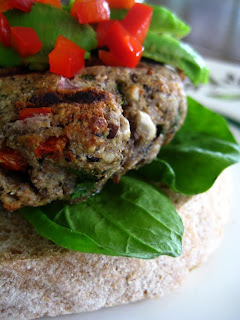 These black bean burgers are juicy, flavourful, and they retain their shape after flipping on the grill! Incredible. Grilled meat yields some of the highest concentrations of heterocyclic amines (HCAs). (2) These compounds form when a combination of creatine (a specific amino acid found in muscle) and sugars, which are both found naturally in meats, are heated during cooking. (3) Grilling is particularly carcinogen-forming because the process involves high heat and long cooking times. Nearly all meats, including chicken and fish, produce significant amounts of HCAs when tossed on the grill. Choosing plant-based foods instead of meat also lowers cancer risk in other ways. Not only are vegetables low in fat and high in fiber, they also contain many cancer-fighting substances. Chalk one up for the bean burger beauty! 1. Put one half of a medium-sized, peeled onion in a food processor and pulse until minced. Add 1 red bell pepper and pulse just until finely chopped. Set them aside in a medium bowl. 2. Combine the garlic, spices, salt, almonds, sunflower seeds, and oil in the food processor and pulse until texture resembles breadcrumbs. Add cilantro and pulse until the cilantro is well incorporated. Transfer mixture to the bowl with the onion and pepper. 3. Put the black beans and water in the food processor and process until smooth. Add this mixture to the bowl along with the wheat germ. Mix (preferably with your hands) completely, and then taste for seasoning – you may want to add more salt, spices, or herbs at this point. 4. Separate bean mixture into six balls and shape into patties. Make sure the patties are not too thin or they will fall apart. 5. Grill for 8 minutes on each side, or until slightly browned. Alternatively, bake at 350 degrees F for 20-30 minutes until heated through. Enjoy with your favorite burger fixings: homemade mustard, natural ketchup, avocado, arugula, red pepper, pickles, tomato, shredded carrot, cilantro oil…be creative! 1. U.S. Department of Health and Human Services, Public Health Service, National Toxicology Program. 2005. 11th Report on Carcinogens. Available at http://ntp.niehs.nih.gov/ntp/roc/toc11.html. 2. Nagao, M and Sugimura, T. Food Borne Carcinogens: Heterocyclic Amines. John Wiley & Sons, Ltd. New York: 2000. 3. Jagerstad M, Skog K, Grivas S, Olsson K. Formation of heterocyclic amines using model systems. Mutat Res. 1991;259:219-33. Made these a couple of days ago and thoroughly enjoyed them! I served them with a dollop of organic yoghurt(they both go together beautifully) and made them a little less than 2cm thick and they held together very well. Also I used dried chille flakes instead of chipotle and quinoa flakes instead of wheatgerm. i love some of your ideas but i will never stop eating grilled meat i will take one exception to your writing most foods cooked on a grill if a person knows what they are doing are NOT cooked for a long period of time for instence i would never cook a burger on the grill for 8 min. the exceptions of course are brisket roasts ribs etc… but sence these things are not made on a grill on an on going basis and generally most grilling is only done for a short time in the summer i would think the risks are minimal there as well . i am going to try your winter abundance bowl this weekend i do love your wrighting and food ideas i have look at your web sight extensivly but i was wondering if you do italian or southwestern foods? Just made these burgers for our lunch. Absolutely delicious! Popped them in the oven for 20 minutes instead of grilling and they turned out perfectly. Thank you for another great recipe Sarah! Love these burgers! But I always have leftovers. I tried to freeze them but reheating them after they’re frozen makes them really mushy and fall apart. Has anyone tried freezing them? If so, how and for how long do you cook them from frozen? I have leftovers at the moment as well. I’d be happy to know whether or not I can freeze the remains. I have bought frozen quinoa burgers at Whole Foods, but I don’t know if they incorporate a special ingredient to help their product hold it’s shape and texture with freezing. Not sure if anyone is monitoring or responding to these posts, but will check in again shortly in hopes of a response. loved the taste of these….but they really didn’t hold together, especially on the grill. Any suggestions? On the above comment, I meant to say that I substituted cooked quinoa for the wheat germ since our family is gluten-free. I made these last night with cooked quinoa and they were great! I baked them instead of grilling them, in case they fell apart, and they worked out really well. The second day (for breakfast), they fell apart a little bit, but I will definitely make them again. Hi! Could I froze those? Thanks a bunch, Sarah! I will investigate these options and report back! Shine on! Hey Avo lover – try quinoa flakes. They seem to have similar texture, or perhaps quick oats. I haven’t tried any substitutions so I cannot guarantee the results, so good luck! That looks so yummy! The recipe will require a little practice, but it will be worth it because it’s both healthy and delicious! I think that even those people who aren’t vegan but love burgers will get caught up once they see this! Mine came out mushy. I added some more wheat germ – big mistake. Add more black beans when making this recipe. Thank you so much for your wonderful recipes! I’ve made quite a few and they are always delicious despite my lack of cooking experience and know how 🙂 I made these along with the parsley root fries for dinner last night. For some reason, the burgers turned out very gritty. Not sure where I went wrong but thought I’d ask for some input. The fries were surprisingly tasty though! Thank you!!! I totally want to make these!